Wherever I go, whomever I meet, people inspire me to do great things personally and in my business. You see, I follow the theory that people are placed in your life at the exact time you need them. They are meant to inspire you and vice versa. From the shop owner to the server at a restaurant, if you open up a conversation, you’ll find it can unite both your worlds. There really is common ground. In talking with people, I find that they really do want to eat healthy, know what’s in their food and buy local to support their community. They are also experiencing real issues: food intolerance, celiac disease, diabetes, etc. That’s the kinds of things that are driving me to develop classes that are healthy for almost anyone. I’ve made connections with some really great local business owners who are providing healthy local products. Just by picking up the phone, going to a business, or emailing them, I am bridging that gap for my customers. It’s really encouraging to be amongst people who have the same healthy goals. I want to share these kinds of resources with my customers. In my workshops, I’ve had some interesting conversations with my customers. I like to get to know their levels of awareness. It gives me the opportunity to let them in on what they might not be aware of. This is the kind of value I like providing. After moving from California to Tennessee over a year ago, I decided early on that I would not be a wallflower. I’ve joined a few groups and have met people who are supporting me in unique ways. If there’s anything I’ve learned, you cannot replace the need for human networking. That will never go out of style. It was a small class tonight, but it wasn’t lacking in personality or quality! Thanks Sandi and Suzy for weathering the storm to come out and make 2 gluten-free pizzas made from cauliflower. Sound weird? Well, I just made two more people love this great tasting pizza! I must add, not only is this pizza gluten-free, it’s a great way to get your servings of vegetables. 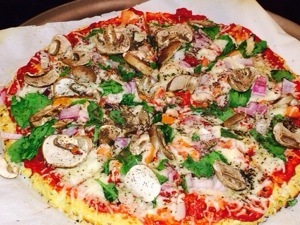 The cauliflower crust contains herbs and garlic and is topped with a homemade pizza sauce. For a side, we made a beautiful spinach salad with a homemade roasted almond dressing. Salad dressing is easy to make, budget friendly and tastes much better than store bought! In addition, you know exactly what’s in it. 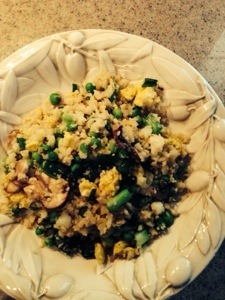 Our next class in March will be on ways to impart some great flavors into your dishes by using alcohol or vinegar.